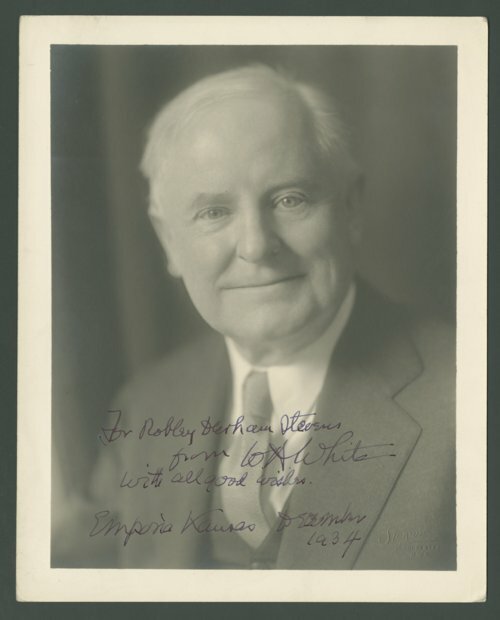 This is a photograph of William Allen White autographed to Robley Durham Stevens. White, a newspaper editor, had something to say on virtually every topic that had anything to do with Kansas or the nation. Born in Emporia in 1868, he grew up in El Dorado, attended the College of Emporia and the University of Kansas and worked on newspapers in Topeka and Kansas City before buying the Emporia Gazette in 1895.Thereafter until his death in 1944 he wrote countless editorials as well as articles and books that earned him the title of the "Sage of Emporia."